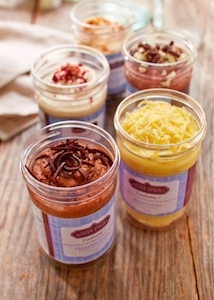 Toronto – Baker Street, a manufacturer of gourmet desserts, launched a line of desserts in a jar called Yummi! The portable line of “layered goodness” includes creamy mousses and icings sandwiched between airy, moist layers of cake. The personal-size desserts come in flavours such as Chocolate Truffle with alternating layers of moist chocolate cake and decadent chocolate truffle mousse. The Red Velvet includes layer upon layer of moist red velvet cake nestled between homemade cream cheese frosting. Meyer Lemon includes moist layers of vanilla cake sandwiched between layers of refreshing Meyer lemon mousse. Chocolate Peanut Butter includes creamy peanut butter mousse nuzzled between layers of rich chocolate cake. Other flavours include Black and White Truffle, Tiramisu, Strawberry Greek Yogurt, and Gluten Free Chocolate Mousse. Yummi! Desserts in a Jar retail for $3.99 and are found in Loblaws, Zehrs, YIG and Valu-Mart.